Chalkboard paint is amazing stuff. I discovered it a few years ago when we did our middle son’s bedroom and now I am discovering new ways to use it. 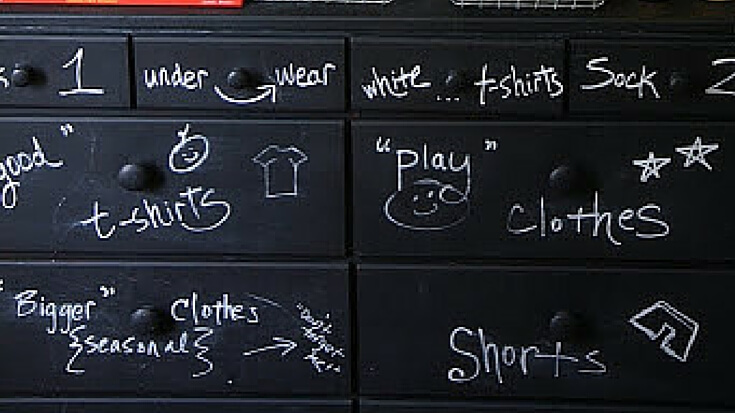 In addition to Mommy’s Command Central, I also have chalkboard in all three kids’ rooms, on my entry closet doors (for leaving messages and reminders to one another) and on my big storage jars I use for flour, sugar, etc. 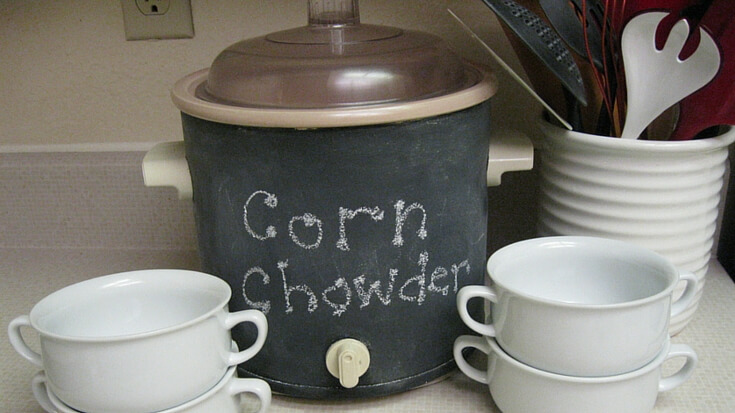 After two years of purchasing Rust-Oleum chalkboard paint, I found out that you can actually make your own. You can create any color you want. The sky is the limit. In fact, sky blue is the color we are using for today’s tutorial. 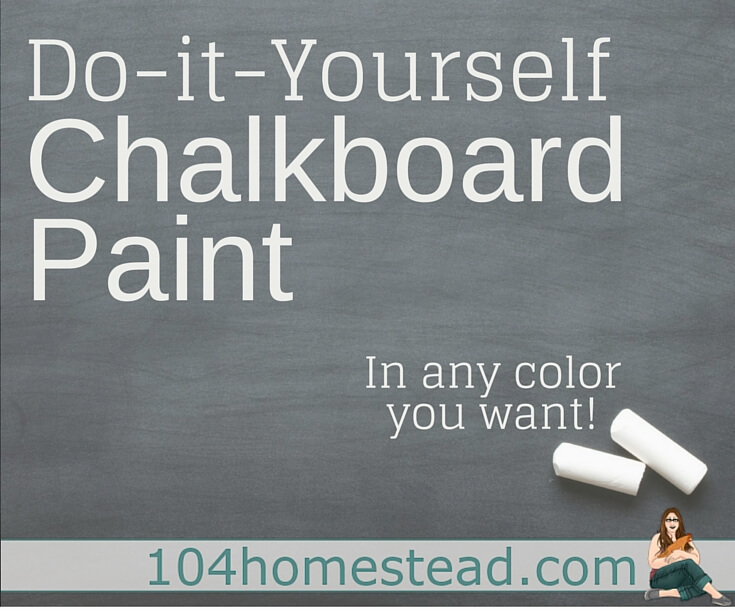 So how do you make chalkboard paint? Combine acrylic paint (mix colors to create one you love) and white non-mixed non-sanded grout at a rate of 1 part grout to 8 parts paint. 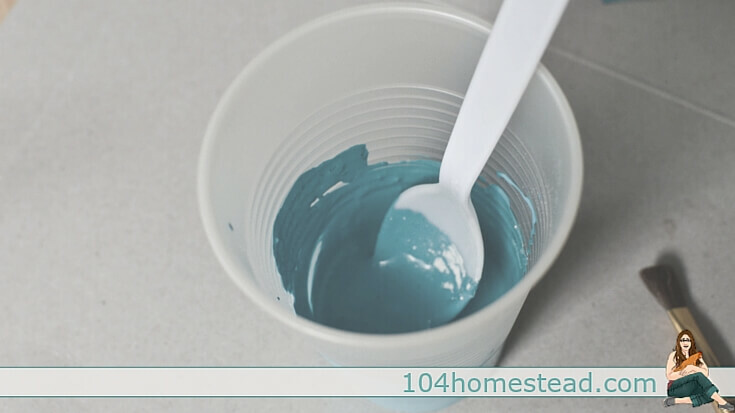 In other words, 1 cup of paint would require 2 tablespoons of grout because there are 16 tablespoons in a cup. 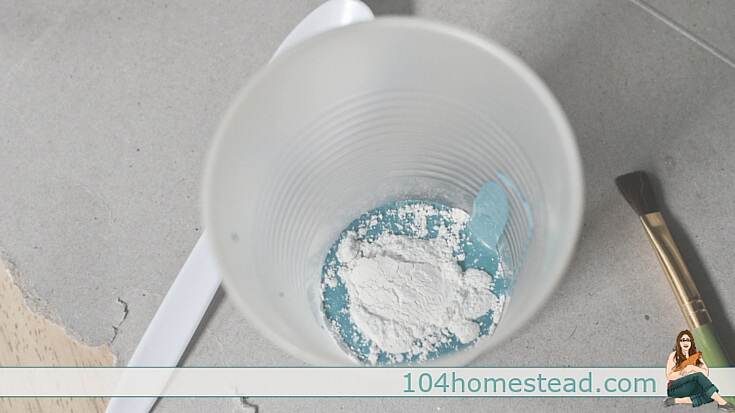 Stir the grout into the paint until no lumps remain. Because the grout is very powdery, you should do this in a well ventilated area. Paint onto practically any surface. It may take 3 or 4 coats. I recommend lightly sanding between coats so it doesn’t get lumpy. When it’s dry you are ready to write! When you are ready to remove your old art, the best cleaner in the world is Coke (yes, the soda). It removes the dusty haze, doesn’t wash off the paint, and leaves no sticky residue. Who would have thought? Our Whiskey Lullaby had a table that needed some TLC. She decided to transform it into a fun table for her kids. See more here. Practically Functional wanted to add a springtime feel to her home. I think she nailed it with these pastel terracotta pots. Make sure you read her tutorial for sealing the pots so your hard work doesn’t wash away in the rain. See more here. Is your crock pot a sight for sore eyes? Yeah, Jane (from Outside of the Crayon Box) had the same problem. With nothing really left to lose, she tried her hand at chalkboard painting it. See more here. 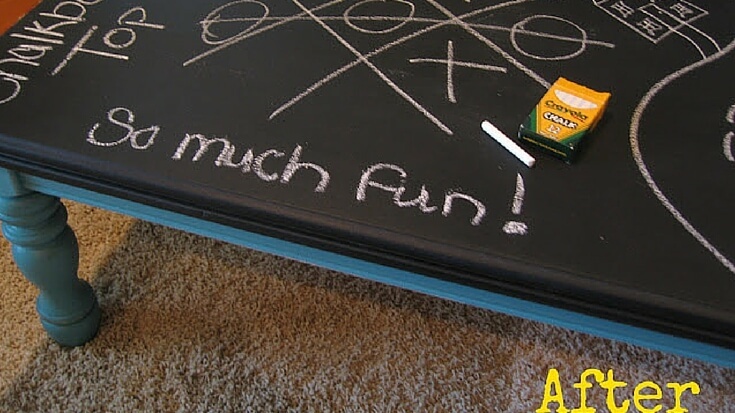 Transform (and organize) your children’s toy area with chalkboard paint. I love how it looks chic enough to fit in an adult space. My kids have stuff throughout the living room in huge primary-colored plastic containers. I’d much rather have something like this. See the tutorial here. This one warms my OCD heart. Our drawers change seasonally. Sometimes a drawer has swimsuits, other times it has thermal wear. With this setup our dresser could change with the seasons. 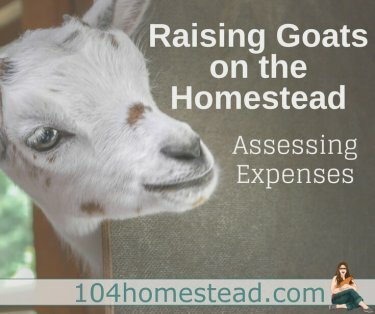 Holly Mathis will talk you through the process here. 12 Uses for an Old Milk Jug – Don’t throw them away! I love chalkboard paint for many things. I painted my desk with it so I can write notes to myself and then erase when done. 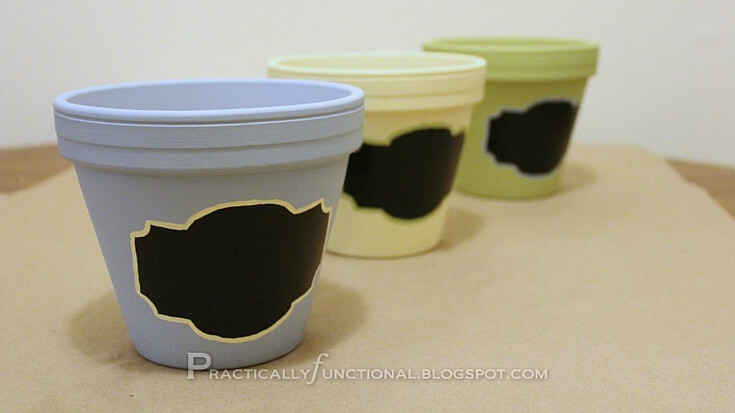 Also, paint planters and write what is in them. I keep meaning to do my planters, but I haven’t been ambitious enough. Maybe this winter while I’m dreaming of warm weather.